Everything is in ruins. A devastating plague has decimated the population. And those who are left live in fear of catching it as the city crumbles to pieces around them. So what does Araby Worth have to live for? Nights in the Debauchery Club, beautiful dresses, glittery make-up . . . and tantalizing ways to forget it all. I've never read the Poe story that was the inspiration for this book, but I don't think that matters, because I was still able to enjoy the story without knowing where the inspiration shone through. The whole book has an air of dark and creepy hanging over it, but considering the world has been decimated by plague and the survivors are hiding in their homes and behind masks, it wouldn't feel right any other way. This book is definitely one for your imagination to run wild with. You've got the steampunk attributes that are always fun to envision, but I think the thing I imagined most vividly and has stayed stuck in my mind, are the masks that people wear to protect themselves from the plague. They are an important part of the story, too, so you can't just forget about them. I honestly don't really know what I think about Araby. She is so unsure of herself and everything else throughout the book, and it left me pretty unsure of her. She hasn't had an easy life and I can certainly see how she justifies some of the things she does, but her voice is definitely still forming. Near the end we start to get a little hint of what we might get from her in upcoming books and I'm really looking forward to seeing more. In this book all of the people surrounding Araby had distinct personalities and specific purposes, while she is still trying to find out what hers is. I actually think it works for the story. Normally I don't care to continue reading about a main character that doesn't seem to have much conviction about anything, but I think Araby's journey will be about becoming someone who fights for what she wants. I really didn't care for the love triangle in this book. It felt too fast from both sides and I wanted a little more development than we got. Don't get me wrong, I really liked both of the guys and cared about what happened to them in the story, but the romances just didn't feel genuine to me. That aside, there was so much going on in this book that it did keep me interested. The mystery behind the plague and the building rebellion were definitely enough to keep me turning the pages. The end was quick and leaves a lot of things up in the air, but I am invested in who Araby can become and what their gang will be able to accomplish. Masque will definitely appeal to people who want something a little dark, but can do without vampires or werewolves. It's not action-packed, but it doesn't need to be and I would recommend it to anyone who is looking for something a little different. I enjoyed this book but like you I wasn't taken with Araby. The love triangle is a little loose but that's fine by me. I love Debauchery District, reading about it made me want to jump inside the pages. 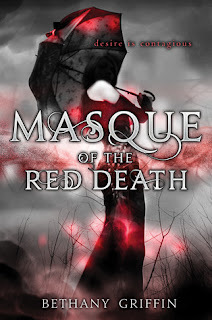 masque of red death sounds amazing!! i know racquel has been dyyyying to read it for a while now haha. i can see why now haha. amazing review! I love a good dark read, I had no clue there was a love triangle I am not the biggest fan of them, I've only seen a few author able to pull that off but i'm still planning on picking this book up. Great review!